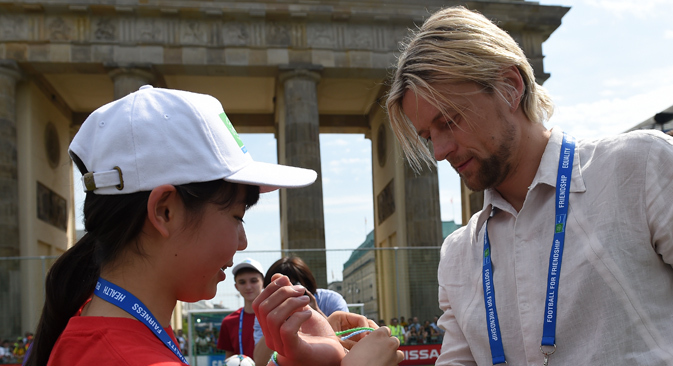 Anatoliy Tymoshchuk, one of the best-known soccer players in the Russian Premier League, recently took part in the Football for Friendship social program, the key event of which was held from June 4 to June 7 in Berlin on the eve of the UEFA Champions League final. In an interview with RBTH, Tymoshchuk, who brought the team from his home town of Lutsk in Western Ukraine to the German capital, talks about the development of children’s sports, motivational success stories and how sport can become an example of mutual understanding in times of political crisis. RBTH: In anticipation of the 2018 World Cup in Russia, there is a lot of talk about the development of mass children’s sports. How can experienced players inspire children who are just starting out in the sport? Anatoliy Tymoshchuk: The differences in the level of training between professional and children’s soccer are significant, therefore, joint training is not held [at Zenit – RBTH], but my personal experience of participating in master classes for children shows that such training helps young athletes to better understand the demands of professional sport, and motivate them to great commitment in training and playing. Not every child can become a professional soccer player for various reasons, but playing soccer will leave positive emotions in the memory. Anatoliy Tymoshchuk began his career at FC Volyn in Lutsk (Western Ukraine). The midfielder made his name at Shakhtar Donetsk, where he played from 1998 to 2007. In 2007 the Russian club Zenit St. Petersburg signed Tymoshchuk’s for $20 million, a record-breaking fee for the post-Soviet region. Tymoshchuk won the UEFA Cup and UEFA Super Cup with Zenit, and in 2009, he moved to Bayern Munich, where he won the Champions League and two Bundesliga titles. In 2013, the Ukrainian returned to Zenit. Tymoshchuk is the captain of the Ukrainian national team and has made more appearances for his country than any other player. The 36-year-old player’s contract with the St. Petersburg club is due to expire in summer 2015. Tymoshchuk has not yet revealed his future plans. I always try to support interesting social projects. The most important thing for the development of children is to receive an additional opportunity to communicate with their peers from different countries, to learn something new, to experience a variety of emotions. RBTH: What do you think: Is the participation of famous sportsmen a ticket to success of such projects? A.T.: We are all different, so the best thing is to try to understand yourself and to realize your potential, to adopt the strengths and best qualities. Famous athletes are success stories that can motivate young people to progress and develop, to make themselves and their life better, more beautiful and healthier. RBTH: The Ukrainian team is taking part in the Football for Friendship project for the second year running. What do you think – can the participation of Ukrainian teams in the Russian project plant shoots of understanding in the current difficult political situation? A.T.: I believe that soccer will remain soccer and politics will remain politics. In soccer, there are two teams that become competitors for 90 minutes and fight for victory. The Ukrainian team had the chance to take part in an international tournament, while Russian teams also have the right to take part in Ukrainian tournaments and projects. A good example is the World Cup, where the teams of Argentina and England, France and Germany, Russia and Ukraine can meet. Perhaps the football is the best example for politicians, the example of a relationship between two nations. RBTH: What do you think, will the World Cup to be held in Russia give an impetus to the development of sports in the country, in particular children’s sports? A.T.: I participated in the World Cup held in Germany in 2006 [for the national team of Ukraine – RBTH], so I can say that the popularity of soccer grew even in such a footballing country with great traditions like Germany. A tournament of this level is going to be held for the first time in Russian history, so it is a good opportunity not only to show Russia to the whole world, but also to spark the interest of every citizen of the country in soccer. Football for Friendship is an international social soccer project that has been held since 2013 by the Russian company Gazprom as part of the Gazprom for Children charitable program. This year the third children’s soccer forum was held: From June 4 to June 7, teams from 24 countries in Europe and Asia gathered in Berlin. The final match, during which the children’s team of Rapid Vienna saw off their rivals from FC Zurich from Switzerland, took place at a venue near the Brandenburg Gate, in the city center. Legendary German player Franz Beckenbauer, the global ambassador of the project, welcomed the participants of the tournament. According to Beckenbauer, the main value of the tournament is that it promotes such universal values as mutual respect and tolerance. The highlight of the forum was the presentation of a special award of the Football for Friendship program – the Nine Values Cup, won by FC Barcelona. Children noted the initiatives of the club consisting in the support and development of children’s soccer, as well as its assistance to young soccer players from developing countries. At the end of the tournament all the children were able to attend the UEFA Champions League final between Barcelona and Juventus, which was held on June 6 at the Berlin Olympiastadion.